Speaking of the Times, this is the image that just appeared when I clicked over to the front page of nytimes.com. 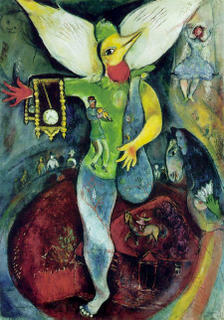 Chagall's brilliant and beautiful "The Juggler". Not too shabby. For the article, click here. Apparently (and I'm bursting with rage as I type this), "arts institutions across the country are cleaning out their closets for auctions starting next week" -- including works by Picasso, Modigliani, and Chagall. Which qualifies as Sign of the Apocalypse #24. After a whirlwind visit to various art museums in France, I'd have to say that selling works of important artists is just short of blasphemy. You can't just deny these pieces from the public and place them in private hands. It's just utterly ridiculous. Even Picasso? Is nothing sacred anymore? Just how popular is The New York Times?